When AMD took to the stage at this year’s CES and unveiled their new Radeon VII GPU, it was quite a surprise! Don’t get me wrong though: fans had been hoping for a new high-end GPU offering from the company that might actually have a chance to compete with NVIDIA’s RTX line of cards, but all of the official development timelines and rumors were pointing to a higher-end Navi architecture slated for release later in 2019 (or beyond, possibly). 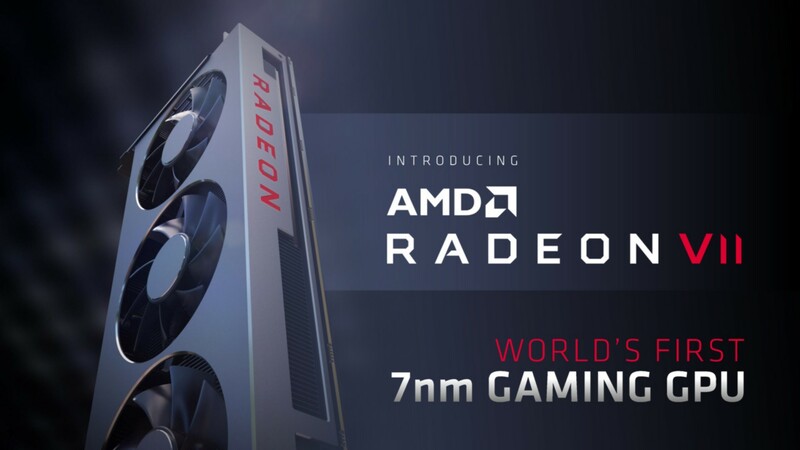 Also, while AMD had introduced the first professional-grade 7nm graphics card (based around their Vega 20 architecture) late in 2018, it was said that this architecture would remain solely in the professional space and that the next line of gaming GPUs would instead be based on their upcoming Navi architecture. So what exactly is the Radeon VII and what can we expect from it? Well, Radeon VII is essentially a gaming-grade variation of the professional Radeon Instinct MI60. It’s a consumer graphics card based on the Vega 20 architecture (or “Vega II”) that will be the world’s first 7nm gaming GPU. Thus, the name Radeon VII is both a play on the 7nm process as well as the Vega II design, which I think is quite clever. The use of the 7nm fabrication process with the Radeon VII as opposed to the 14nm one used with Vega 64 and Vega 56 yields two different benefits: a lower overall power draw per performance and the ability to achieve a lot more with the same amount of physical space. In other words, Radeon VII will provide gamers with a more efficient version of the Vega architecture that can achieve a much higher clock speed with a reasonable amount of power consumption. Further, this new GPU features a whopping 16GB of high-bandwidth memory (HBM2 to be specific), clocked at a massive 1,024 GB/s, leaving it lots of room to work with very high resolutions. According to early benchmarks, the card looks like it will trade blows with NVIDIA’s own high-end RTX 2080, beating it out pretty decently in some cases. However, AMD has been more keen on comparing it to their previous Vega line of gaming cards, saying that the Radeon VII offers more than a 60% performance boost versus the Vega 64 in some cases. At a mere $699 asking price, the temptation to pick up a Radeon VII as opposed to an RTX 2080 is quite alluring, especially given the higher amount of memory the Radeon VII offers. The card is set to officially release on February 7, 2019. Now, what about AMD’s Navi line of graphics cards? For those, we’ll need to wait a bit longer to find out any official details!